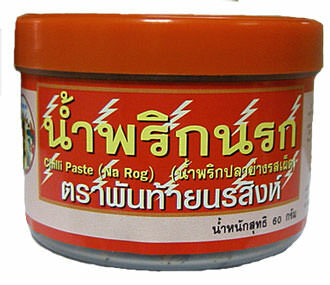 Namprik is the original Thai chile paste and it's hard to find in the United States. Most Thai people leaving their country don't go without a few jars of their favorite namprik. We are pleased to offer this premium quality fresh product from Pantainorasingh. Narok means "hell" in Thai language, and this has a higher chile heat than most. Simply spoon over steamed jasmine rice or use as a dip with fresh vegetables. Ingredients: ground fish, chile, fish sauce, tamarind, soyabean oil, palm sugar, salt, lemon juice, msg, disodium 5-inosinate E 631, disodium 5-guanylate E 627. Product of Thailand. We also have a recipe that allows you to make this at home, if you have the time and energy, and it may take some practice to get it right. Recommended as a dip for Thai barbeque beef salad. This recipe is normally made from sun dried chilis. You can chop fresh chilis and spread them on a cookie tray and put them under the broiler until fairly dry. This sauce keeps well, and is popular as "traveler's fare" in Thailand, being used as an accompaniment to various dried meats and sliced vegetables. We now offer an excellent premade Narok chile paste. One of our favorite recipes, the meat is barbequed then tossed with a delicious mixture of sweet, sesame-inspired smoky hot sauce and fresh vegetables. It should be served with jasmine rice, but it's also delicious with sticky rice (soaking up the sauce). Yam nuea literally means "tossed beef". This is a simple beef "salad", and can be eaten hot or cold. This should be on the hot side of neutral, but really is more spicy than "hot". It is normal to add sunstantial amounts of hot condiments to it to suit yourself (see the section on condiments below).